This book presents the fundamentals of polarimetric radar remote sensing through understanding wave scattering and propagation in geophysical media filled with hydrometers and other objects. The text characterizes the physical, statistical, and electromagnetic properties of hydrometers and establishes the relations between radar observables and physical state parameters. It introduces advanced remote sensing techniques (such as polarimetric phased array radar) and retrieval methods for physical parameters. The book also illustrates applications of polarimetric radar measurements in hydrometer classification, particle size distribution retrievals, microphysical parameterization, and weather quantification and forecast. 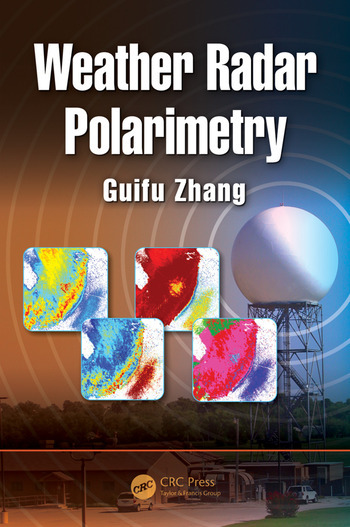 "Zhang’s text is an outstanding, up-to date account of polarimetric radar measurements as applied to hydrometeor classification, retrieval of microphysical properties through the use of data- assimilation techniques, and the measurement of polarimetric variables by phased-array radars. This text will be invaluable to students and researchers who are applying cutting-edge radar sensing technology and numerical forecast techniques to improve forecasts of precipitation and severe weather." "This is a unified treatment of ‘weather radar’ and ‘polarimetric radar.’ These two areas are closely related, but often treated separately. This book treats these two areas from a unified point of view and, in addition, it has some new ideas such as ‘array radar polarimetry.’ The book will be useful and give some new ideas and insights for future weather research." "Tremendous progress has been achieved during the recent decade in operational implementation of the weather radar polarimetry, and dual-polarization radar is becoming a standard for operational weather radar networks around the world. This book perfectly fits the needs of the radar and meteorological communities which have to be better educated about the advantages and potential of this new technology." "Dr. Zhang’s wide range of expertise in formulating and developing focused research to solve cutting edge problems in radar meteorology has made this book attractive to academic, research, and operational communities. The author interweaves science and engineering aspects of weather radar polrimetry seamlessly. This approach has made the book valuable course material as well as a great resource for practicing radar meteorologists." "This is a valuable reference book on weather radars and their associated algorithms, and it is written by a vital member of the University of Oklahoma Advanced Radar Research Center. As someone who originally studied physics for his B.S. degree and then, apparently, became an enthusiast of the physical interactions occurring around hydrometeorological targets, Prof. Zhang has poured all of the necessary physical explanations, relevant equations, and measurement techniques involving modern polarimetric weather radar into this book. The work is impressively organized in the ascending complexity of the topics it covers. An engineer or scientist who is new to the subject will find it very easy to read, since it covers almost all of the necessary preliminary information in a highly descriptive manner—amazingly, without forcing the reader to check many of the previous references." "The text summarizes weather radar theory and design, incorporating many in-service weather radars as examples. It extensively uses mathematics and statistics as tools to establish the theory and includes high-quality photos of weather radar outputs. This textbook is an excellent resource for graduate-level courses as well as for weather radar researchers."